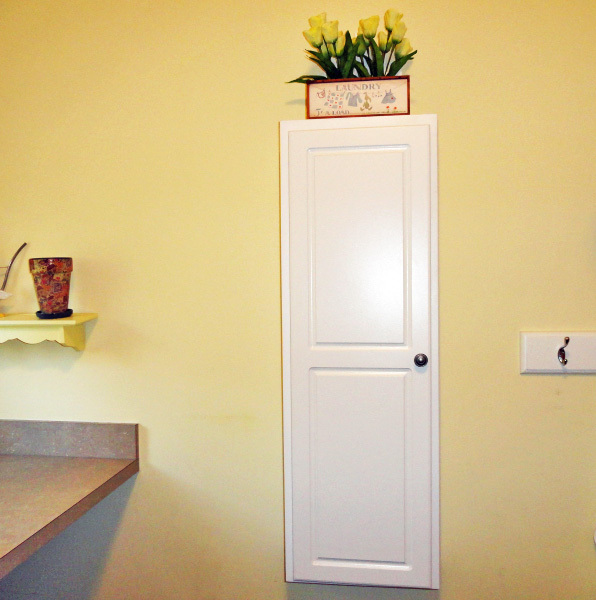 A laundry room can sometimes be a forgotten room when it comes to decorating. It is a room most of us don’t want to spend a lot of time in. However, it can at least be a little more pleasant to look at when we have to do those never ending chores of laundering, folding and ironing. One fun and easy way to decorate a laundry room is with vintage accessories. If you go to any flea market or antique store, you will find lots of fun items to choose from. There are vintage ironing boards, irons and wash boards for obvious choices. 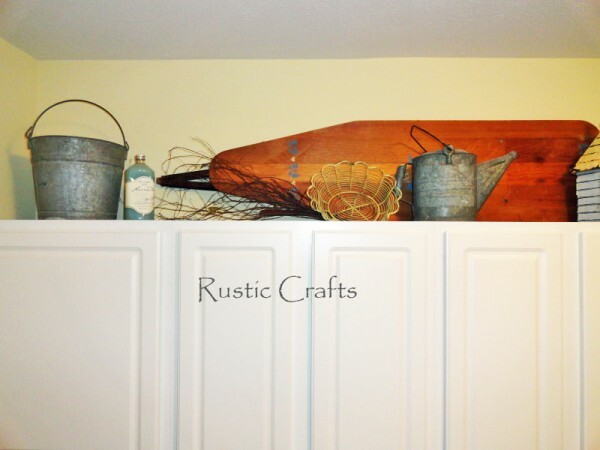 But, you can also find tin buckets, watering cans, old clothespins, and even detergent boxes or old soap containers that work well in a laundry room. 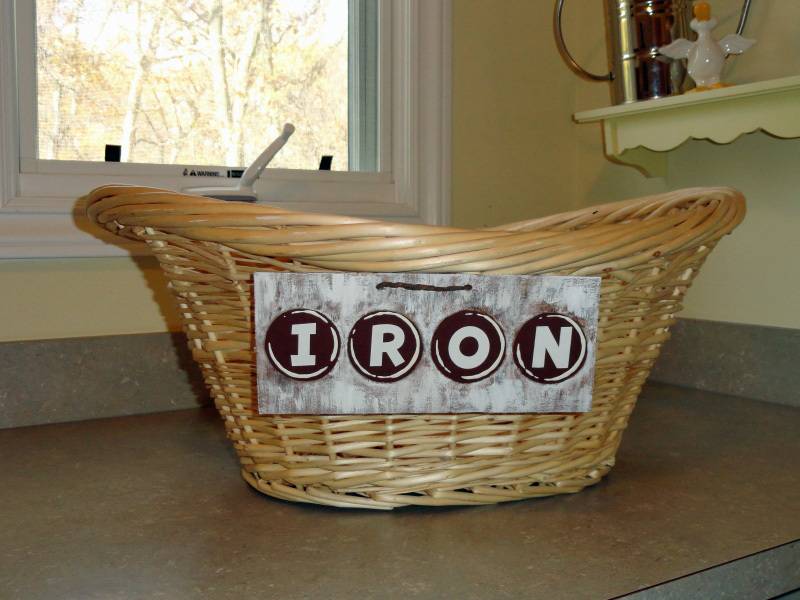 We were given an old tin bucket, from my husband’s grandpa, which I thought would go perfect in our laundry room especially when I paired it with a vintage looking bottle of fabric softener. 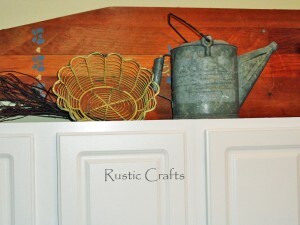 I placed them above our cabinets which works well for displaying all of our vintage items. I don’t remember where I got the wire egg basket but am pretty sure that it is a reproduction. Since it was yellow and my walls are yellow, I thought it would give a nice bit of color with all of the neutral up there. I picked the ironing board up from an antique fair. I hate ironing but love the look of old wooden ironing boards. The hardest part was getting the ironing board up over the cabinets. A ladder probably would have been the smartest choice but I pulled up a kitchen stool and hopped from that to the top of the dryer and swung that baby up over my head and plopped it in place. I love to live dangerously! That is where I like to keep it too! Unfortunately, I always have a basket full of my husband’s dress shirts that I really must do. I can’t send all of them out to the dry cleaners. 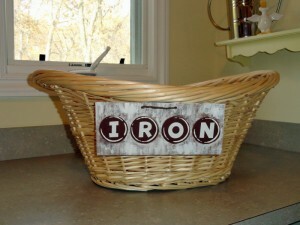 I decided to make a label for my basket to help remind me why they are sitting there. 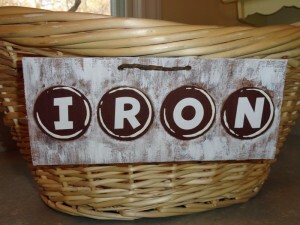 I painted a label on cardboard to look like vintage typewriter keys and then attached it to my basket with bark covered wire. Since I had a vintage theme going, I figured I would make my label vintage looking. You will notice that the basket is empty. 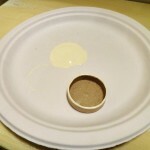 That is only because I emptied it for the picture and it will be once again overflowing! 1. First I cut a piece of cardboard to size and punched two holes at the top to weave my bark covered wire through. 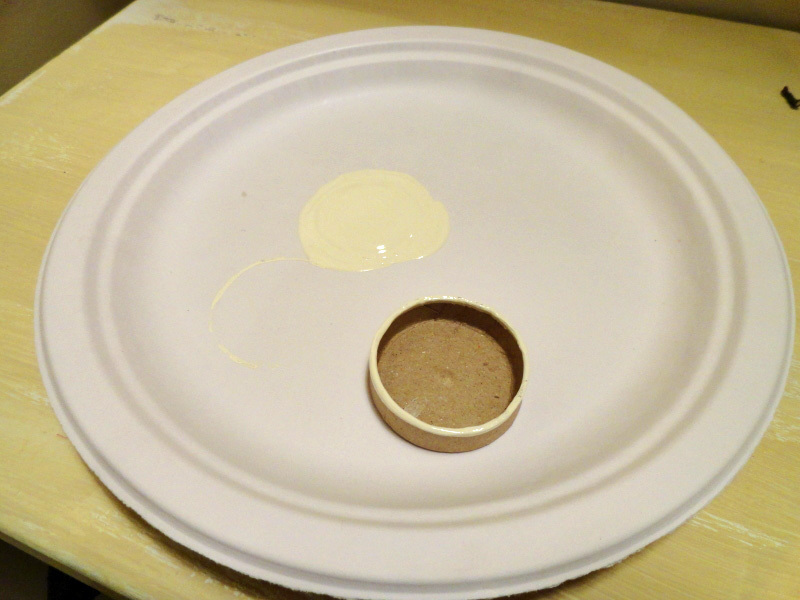 I traced four circles and painted them brown. I then applied Weathered Wood to the background. 2. 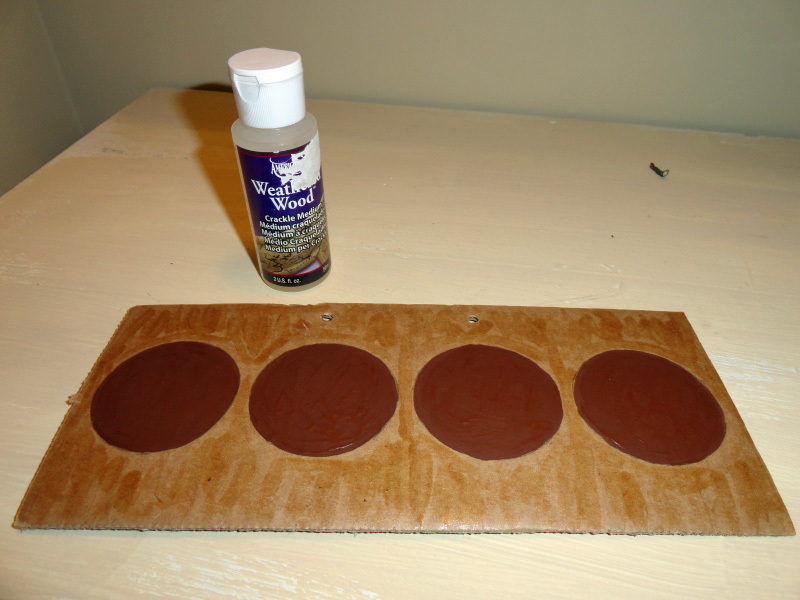 I used opaque raw umber acrylic paint and white wash paint to paint over the weathered wood medium. 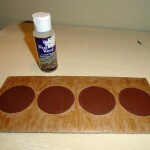 This gave a nice distressed wood looking background. 3. 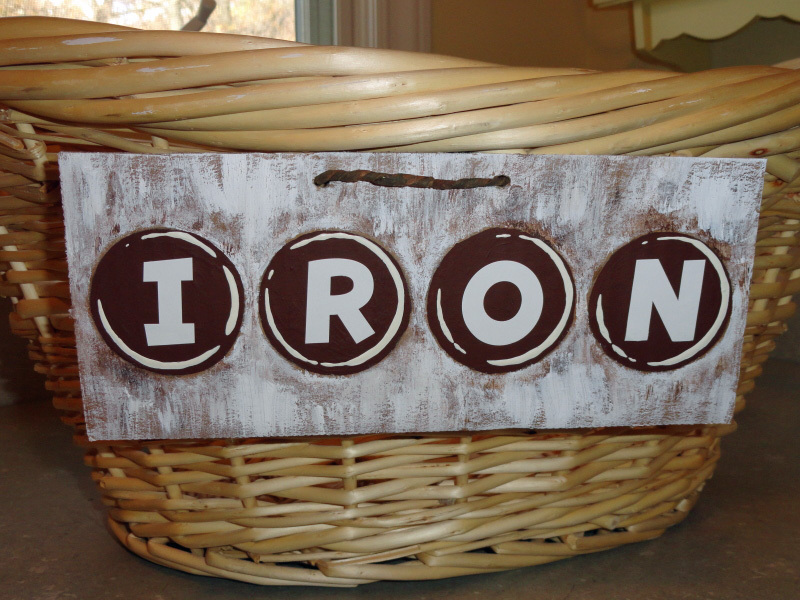 I adhered my letter stickers to each circle to spell out the word “iron”. 4. I used a paper mache circle lid that was just a little bit smaller than my painted circle to dip in cream paint and stencil on an uneven trim circle around the letters. 5. I inserted my bark covered wire and attached it to my basket. 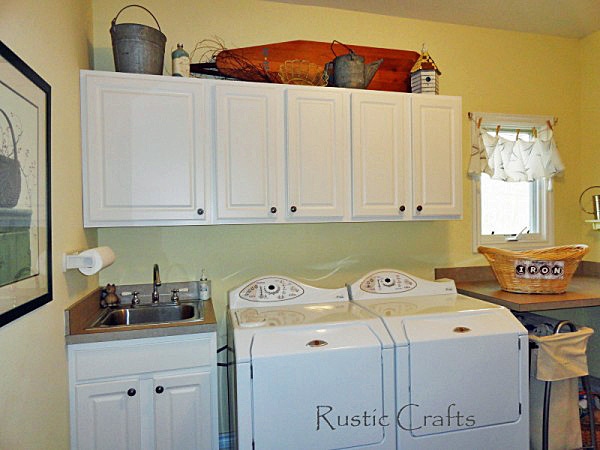 So, whether you use vintage accessories or vintage inspired decor your laundry room will be a little more warm and inviting with a pull from the past. I love your laundry room, here is the South many of us have our washer and dryer in the garage since we have no basements we are so short on room! If I had one in the house i would love to decorate it vintage!! Thanks so much for the inspiration! 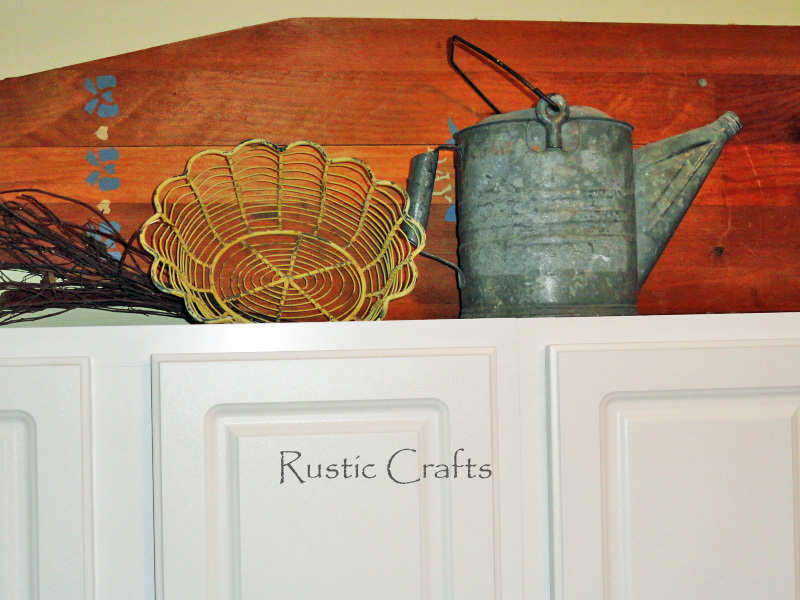 I just decorated my laundry room with vintage finds, I loved the old wooden ironing board you put on top of your cabinets so much that I found one and did the same thing.